AS RENOWNED YOUTH LEADER MR MYKEL LOTA AROKO LEADS OVER HUNDREDS OF HIS FOLLOWERS TO THE PROGRESSIVE FOLD. ENJOINED NIGERIANS AND DELTANS IN PARTICULAR TO KEY INTO THE CHANGE MANTRA. 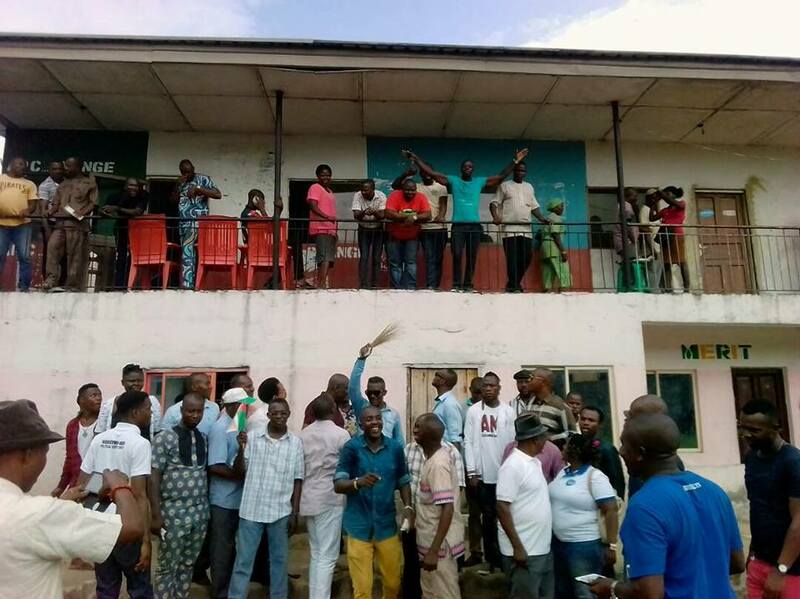 Over hundreds of the People Democratic Party (PDP) members in Udu Local Government Area of Delta State defected to the ruling All Progressive Congress (APC) on 22nd May, 2017 at the Party Secretariat in Udu Local Government Area. The Defectors whom were led by Delta Born Activist, renowned Youth Leader per excellence and Advocate of People oriented Leadership and Governance; Mr Mykel Lota Aroko plodded into the Party Secretariat gleefully. Welcoming the defectors on behalf of the State Chairman, the Udu APC Chairman Comr Isaiah Masheni handed over the party membership cards, flag and symbolic Broom to Mr Lota and his teaming Supporters while assuring them of immediate integration into the Party as he pledged to call an all inclusive meeting of the Party in the Local Government for a proper familiarization. Responding on behalf of his strong base Supporters, Mr Mykel Lota whom is fondly call "King of the Ghetto" said: "I have been a member of PDP for the past eighteen years, I saw the urgent need to join the progressive family so as to key into the positive change mantra of the the ruling party. He further stated that President Muhammadu Buhari led Federal Government is friendly to the Urhobo as the "Urhobo now have the NDDC EDP, serving Ambassador and many more coming ". In his preparation and readiness for forth coming Local Government Election in the State, he announced a free bus transportation service to convey his Supporters and others to register at Otor-Udu in the ongoing INEC Continuous Voters Registration as he strongly affirmed that " the era of bailout Box snatching is over". While commenting on the Change Government, he affirmed his believe in the Federal Government and he enjoined Nigerians and Deltans in Particular to key into the Change Mantra as it is "a true vehicle for positive change" He opined. The defection ceremony was graced with high party Hierarchy in the State and Udu Local Government whom include State Legal Adviser; Barr Valentine Onojeghwo, Udu APC Chairman; Comr Isaiah Masheni, Udu APC Secretary; Snr Apostle Kpeku, Udu APC Treasurer; Mr Robinson Orovwotu, Udu APC Youth leader; Mr Ejoor Mukoro. Others are Mr Omeco Daniel Ekorhi, Hon. Kingsley Eterisan, Hon. Benjamin Sharta, Hon. Duke, Hon. Ogbe, Hon. Okolobi, Udu APC Woman Leader, Udu APC Publicity Secretary, Mr Ejiro Apepe, Chief Tataunu, Comr Freeborn, Comr Kpedi Austine, Udu APC Chairmanship and Councillorship Aspirants, Ward Executive members among others.